The RCR C-series remote control receiver is designed to provide a quick and cost effective solution for a variety of wireless applications. The receiver includes an external antenna, decoder and 10A-relay outputs. The receiver offers excellent sensitivity and selectivity by its utilization of SAW technology and state-of-the-art low noise amplifiers. An external jack is provided for external long-range antenna. Applied Wireless’ proprietary C-Code protocol provides a very high degree of security, with more than 16 million transmitter ID codes. 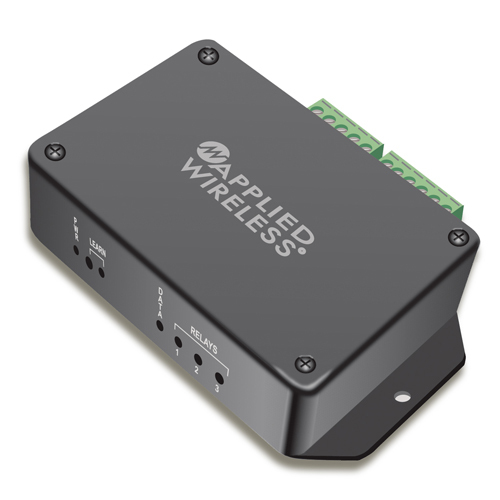 Units are designed to work with Applied Wireless KTX and KTXW C-series remote control transmitters. This is a “learning” receiver, and can learn up to four different factory-coded transmitters. For applications using many remote transmitters, a unique “house” code can be assigned to all the transmitter remotes. *When used with DP300A or DP400A dipole antennas. Typical range is 300-400 ft. when used with standard non-ground-plane whip antenna (included). Longer range with KTXW303C6-n handheld remotes.